A new project is being proposed which is expected to reduce pedestrian accidents and make conditions safer for walkers throughout Bradenton, FL. 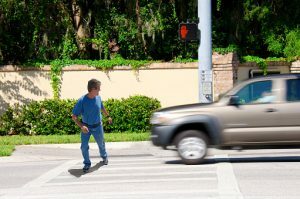 A July public hearing on the project was held to discuss ongoing efforts to improve pedestrian safety, according to Bradenton.com . The project is still in the design phase and construction is expected to begin within 18 months. Getting the public's input during the design phase is essential to ensuring that the project is actually able to meet the needs of the community by focusing on how people walk and drive in the area. Public improvement projects like this one are essential, especially as Florida is one of four states where 42 percent of all deadly pedestrian accidents occur, according to Governors' Highway Traffic Safety Administration. If streets are made safer, deadly collisions can be prevented. The new project involves making changes along Eighth Avenue West, in the location between Ninth Street West and 14th Street West. A median will be constructed in the area and designated turn lanes will be added. Crosswalks will also be added to the area as well. The site was chosen as an effort to make it easier for pedestrians to get between the Village of the Arts and 13th and Old Main Streets, as both of these locations have crosswalks while the area to be improved doesn't have safe spaces for pedestrians to cross. To make room for the projects, the existing lanes on Eighth Avenue West will be reduced to 11 feet. The roadway will now be narrowed. However, the sidewalks are going to remain the same and no bicycle lane is being added, despite some biking advocates urging for one. The mayor indicated the project is in response to ongoing concerns expressed by both residents and business owners within the village. Realize Bradenton worked together with the community on a Village of the Arts Tapestry Plan which was focused on, among other things, making the city arts district a safer place for pedestrian travel. The Village of the Arts Tapestry Plan also addresses the need for improved outdoor lighting in the area. Hopefully, this change will be a positive one which can reduce the risks of pedestrian accidents in Bradenton where people walk frequently. As more people opt to walk and bike, additional changes and improvements will be made and the overall number of pedestrian fatalities in the state of Florida will begin to drop.